A one-time donor, let’s call her Donor X, opts in to receive your e-mail updates. Great, you think, another subscriber! Then, after a few email sends, you realize that Donor X has yet to click through a single email. What gives? As it turns out, Donor X is one of 61% of people that reads e-mails on a smartphone or tablet – a number that has grown 400% since 2011. (And yes, 2011 was barely 3 years ago). Donor X is also one of the 80% of people that will delete an e-mail that doesn’t look good on her mobile device or, even worse, one of the 30.2% of those who’ll simply unsubscribe from the list alltogether. Not only that, but Donor X is among the 75% of people who have a negative perception of your brand after being unable to view or interact well with your e-mail on a smartphone or tablet. Yikes! In a less harsh variation of this hypothetical, Donor X may actually be interested in your email, thinking “I’ll get back to this on my desktop when I get home…” But even in this situation, there’s only a 3% chance that Donor X will ever open that e-mail again. When you read about statistics like this, it’s easy to see how not having a mobile strategy can result in a breakdown of communication. So, how can you keep the Donor Xs in your life engaged while they’re on the go? Before we talk about Donor X, specifically, it is important to know who your donors are. It might be true that Donor X is not a typical supporter of your particular nonprofit organization, but it is absolutely essential to find out. While there are different variations of this topic covered on the Classy blog, (try here and here), the main point is that paying attention to who donates, when and through what channels increasingly pays off. Learn about who your donors are and then how their demographic is currently interacting on mobile. For example, 61% of women 24-49 spend the greatest share of their Internet time on mobile devices now. If your audience is largely women in this age group, investing in a mobile strategy will be critical for your nonprofit organization. Track internal trends by utilizing a CRM like Salesforce to uncover the details and habits of your audience. Keep up on external trends through one of the many institutions providing statistics on the demographics of online activity – Pew Research, Gartner or even Google – and lots of SaaS services like Litmus and Kissmetrics provide trend data as well. Match your internal and external data to make decisions about the direction of your mobile strategy. When the majority of online time was spent at a desktop, users were committed to that place and time. They connected to the Internet, sat at a fixed spot and browsed around. 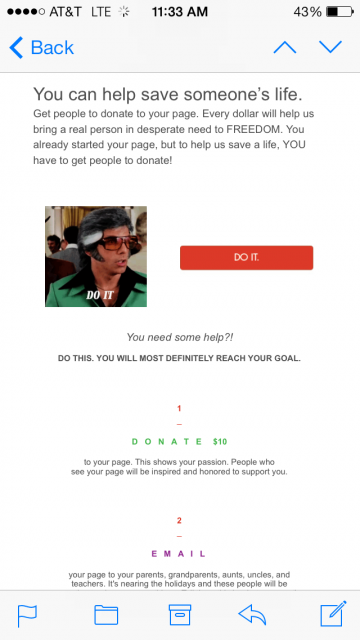 In the new age of mobile, Donor X’s attention is almost never committed to you and you alone. The ubiquitous availability of the Internet means no one has to dedicate a particular timeframe to browsing. When Donor X is on the phone, there are a million chances for her to become distracted – she’s getting text messages, watching where she’s walking, and being interrupted by a friend arriving for a dinner date. And things move faster on mobile too. Users are on the go, so they are constantly weighing whether or not it’s worth their time to pause and retweet, share something on Facebook or forward on to a friend, let alone fill out a form to donate to a cause. These split second interactions are critical moments of communication between your organization and Donor X. Relationships with the Donor X’s of the world are increasingly built upon “from names” and “subject lines.” While sometimes we are tempted to spill all the beans in one e-mail, we need to grab attention swiftly. Be direct, captivating (but not overdramatic), and real. I certainly don’t mean donors aren’t altruists (of course they are, they’ve contributed to your cause!) but if they’re like Donor X, a lot of their daily browsing and activity takes place on their phone and mobile technology is inherently self-involved. When you’re on a phone, you can easily escape into your own world at any time and any place and there is no requirement to be engaged with anything around you. In that context, it is important to be donor-centric in your mobile communications. Convincing Donor X that your cause is her cause before she even reads the whole e-mail is critical and will motivate her to act on your CTA – maybe she’ll even take the time to register as a recurring donor, forward the e-mail to friends and family or create a social media post. Take this example from LINK (Liberty in North Korea), opened on an iPhone. You can help save someone’s life, it reads, with a simple but catalyzing CTA – DO IT. You is repeated several times, making it clear the power is in your hands to change the direction of someone’s life. It is obvious for Donor X where to click and then how to succeed at and share her goal with friends and family. 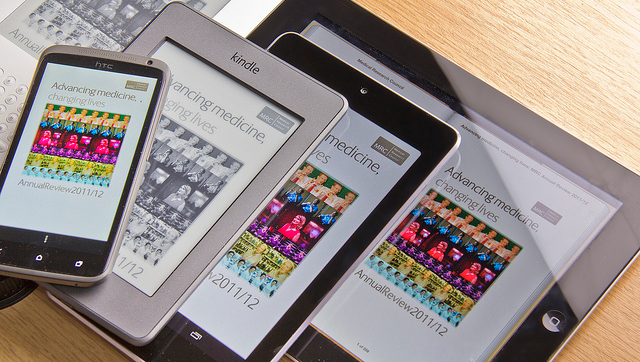 Mobile devices are more interactive and responsive than ever. Instead of clicking, we touch, swipe, scroll, and shake around the Internet. Once, you’ve got Donor X interacting with your email think about revisiting your CTA copy to reflect how Donor X is actually using her phone. Rather than asking Donor X to “click” on things, try more interactive directives that might drive her to react more naturally on her smartphone. If you are creating responsive e-mails that are seamless between desktop interfaces and mobile, try device-neutral CTAs like “read now,” “donate here,” etc. On a mobile device, Donor X doesn’t have the time or patience to troubleshoot why they can’t easily reach your landing page or make a donation. E-mail with a purpose, make your CTAs mobile friendly, and then minimize the number of steps between opening an e-mail and the end goal. For example, studies on conversion rates in retail have shown that the less clicks to checkout there are, the higher the conversion rate will be, with Amazon’s “1-Click to purchase” technology being one of the most well known of these examples. Taking the time to work on a well thought out conversion process will improve your mobile strategy, since you’ll already have thought about keeping things simple and easy. It is already difficult enough to capture mobile device users’ attention through subject lines, and message previews vary by device, so take every opportunity to simplify and streamline the engagement process, especially as your ask increases in complexity.